There is a need for yet another kind of reality check. The convergence of the promise of a new grand vision for parks by the Mayor while the city’s Real Estate Asset Department (READ) pushes ahead with the sale of city-owned properties brings us to an important crossroads for determining the future of the Commons for the City of San Diego. As the City is about to embark on this new, grand vision, it is important to ask how are we doing in protecting and preserving the existing parks and open space. The Commons is now an almost archaic term used to describe lands owned or used by all the inhabitants of a place. Parks and Open Space comprises a large portion of the San Diego Commons and is one of the most enduring legacies of many citizens work over many decades. The value of open space is well documented in the City’s General Plan and other ordinances and policies – visual relief, recreation, habitat, storm water control among them. It plays a different but complementary role than developed parks in enhancing our neighborhoods. Testimony at the City Council hearings adopting the Climate Action Plan included the value of open space lands, in particular the root systems of plants spread throughout the region’s natural open spaces and regional parks. It was stated that the root systems actually provide far more carbon absorption and sequestering than the above ground vegetation and the coastal waters combined. We have many thousands of acres of natural open space that have been set aside in San Diego. As the City is about to embark on this new, grand vision, it is important to ask how are we doing in protecting and preserving the existing parks and open space. Who determines how different lands are used and who feels entitled to determine their use or obtain them for their own use can take many forms. Open space–Commons for all or land grab for some? Recently, armed militants occupied a Federal wilderness facility in a rural Oregon area claiming that they want to free the land for use by ranchers and loggers and more generally “the people”. In most local jurisdictions a more subtle “land grab” strategy is employed. The forces pushing for up-zoning of private land or privatization and/or sale of publicly owned properties are a different kind of militia. Armed with lobbyists and campaign contributions, they and their allies are quietly but steadily changing the local landscape. Last summer San Diego Free Press asked the question “Where There is Smoke, is there a Fire Sale?” regarding proposals by the City Real Estate Assets Department (READ) to sell off “excess” (aka “surplus”) city-owned (ie, owned by all the inhabitants of the city) properties. There are currently 28 properties throughout the city proposed for sale. In an attempt to answer that question over the last several months there has been considerable discussion with stakeholders, City staff, City Council members and their staffs, research, and interviews with open space and canyon preservation advocates and community members regarding the proposed sale of properties (see list at conclusion of this article). So far the READ proposals may not qualify as a “fire sale”, but there are definitely smoldering camp fires fed by the ever shifting political winds at City Hall. This is not the first time that lists of candidate properties have been assembled. In 2007 several properties were listed, but pulled from the fire when the real estate bubble burst. Once the City was engaged in actively acquiring open space and park lands through bond issues and other regulatory mechanisms to fulfill the General Plan promise of an integrated open space system throughout the City. Now, what few funding sources were available for land acquisitions have been diverted to maintenance and other uses and some parcels formerly acquired for open space or designated for such uses are being put on the for-sale list. Will the Mayor’s vision reinstate those diverted funds back to land acquisition in the upcoming budget process? On Wednesday, January 20, READ staff was scheduled to return to the City Council Smart Growth and Land Use Committee, seeking a recommendation to authorize marketing three of the properties they identified as excess last year. The item was inexplicably changed to another issue within hours of its posting this last week. Articles and communications from interested parties regarding the proposal to sell the “Truax House” property next to Maple Canyon in the Bankers Hill area of Uptown, as related below, released a veritable fire storm of its own that may have been a factor in delaying the item until next month. There are thousands of acres of land that appear on City maps as streets that are not paved. They are referred to as “paper streets”. In most cases they fall into canyons and will never be developed as streets. They are sometimes “vacated” at an adjacent property owners request to enhance their property holdings. Occasionally they are incorporated into a canyon open space system. Here are two examples of properties that are being proposed for sale that include paper streets. Two recent San Diego READER articles by Dorian Hargrove, “Maple Canyon Conundrum” and “Historic or Perfect for a Park” have highlighted the impact on public access to a canyon located in the Uptown Community Planning area of the proposed sale of one property tagged by READ as “excess”. 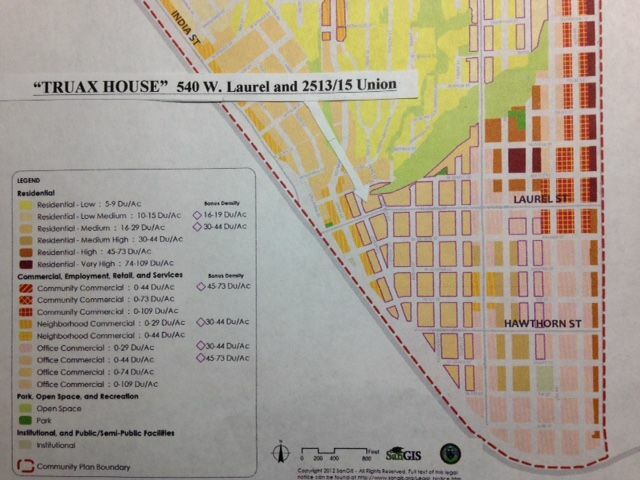 The property was labeled “Truax House” on the “Excess Sales Using Brokers” list in a READ power point presentation as an information item to the City Council Smart Growth and Land Use (SG&LU) Committee last June. The property which actually includes two houses and a vacant lot was acquired with gas tax funds in 1965 for a proposed street extension. It turns out that the parcel’s vacant land portion was included as designated open space in the Uptown Community Plan, since it could provide access to the Maple Canyon hiking trail. Or so community members and the “Friends of Maple Canyon ” thought. In early December Councilmember Todd Gloria’s Deputy Chief of Staff Katie Keach stated that the Planning Department was claiming that was a “mapping error” and it would not be so included in future versions of the Plan that is being updated. Instead the parcel now appears on the Plan’s land use maps in an area coded as “residential, medium high” which would allow the building of 29 units to 44 units per acre or 20 units on the .68 acre site to as many as 30 units if the bonus density is exercised. Of course, that would require the demolition of the two existing structures, one of which has been rented to the same tenant through the Housing Commission for nearly two decades and the other is arguably an historic building. Both buildings command an impressive view of the bay, the Coronado Islands and Point Loma. This “interested City resident” showed up for the open house for qualified brokers last summer to tour the vacant early 1900’s Victorian style house. On the entrance foyer wall was a photograph of the late Dr. Brad Truax and an array of plaques and proclamations in his honor. Dr. Truax had been a key leader in the 1980’s advocating for funding and action to combat the HIV/AIDs crisis. The house had once been leased to the Aids Foundation and used as a hospice facility and then briefly to Father Joe’s Villages. After informing Councilmember Gloria of the existence of these historic artifacts, they were removed from the building and purportedly provided to Lambda Archives. Charles Kaminski, local architect and community activist, serves on the Board of Lambda Archives, a non-profit which has advocated for a state funded project currently underway to document historical resources including properties of significance to the LGBTQ community. Since learning of the proposed sale of the Truax House he has conducted his own inquiries into the site. Senior Policy Advisor to Councilmember Gloria, Stephen Hill provided some additional background to him showing that this and adjacent properties were considered for sale by the City as long ago as 1980 and 1987. As remote as these actions were nearly 30 years ago, they were included in the backup material by READ for the January 20 action. Also included was a notation that the appraised value is $2,470,000. The appraisal itself with any relevant justification or assumptions was not included in the public back up information. We do know that given the demurrer by the Park and Rec Department someone has reason to believe they can get at least 30 units on one helluva view lot if they can meet or beat the appraised value. The proceeds from sales of surplus properties either go to the Capital Improvements Fund for distribution in accord with recommendation by a special staff committee or in some cases back to the fund which enabled the original acquisition. In the case of the Truax house parcel, staff believes that the proceeds from the sale must go back into some kind of gas tax fund, even though those gas tax moneys were expended over a half century ago and enabling guidelines don’t seem to indicate that restriction. 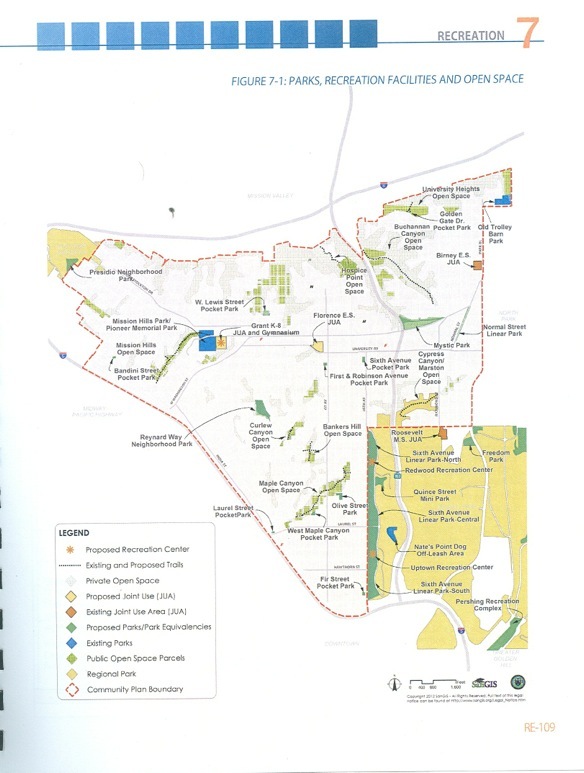 The Executive Summary Sheet provided for the item restated that “Due to slope issues, existing structures, and lack of connectivity to Maple Canyon Open Space, City staff cannot justify this location for park uses”—a point that is hotly disputed by Uptown residents and open space advocates. While the real estate and development campfires smolder in City Hall, a virtual firestorm of community activity has emerged around this issue. 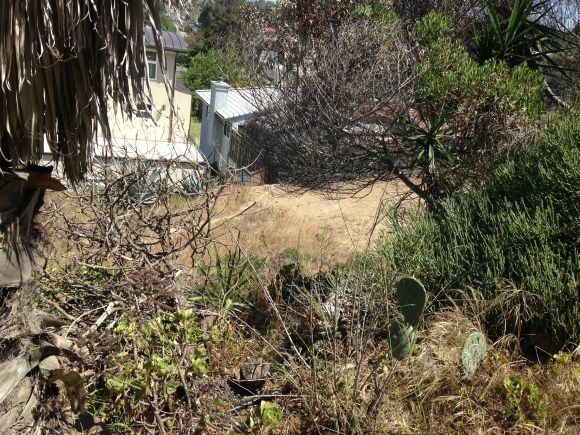 According to the Uptown Quest, the “Metro San Diego Community Development Corporation (CDC) voted unanimously to request that City Council remove the property from the surplus list until it can be properly evaluated for its connection to Maple Canyon and the historic status of the Truax house. If you are wondering why the Friends of Maple Canyon or the Uptown Planning Group, or the Metro San Diego CDC or CanyonLands or Lambda Archives or SOHO or …(pick your relevant stakeholder)… is not listed for the latter two required information, join the club. Perhaps the rescheduling of this item to February will provide time for community stakeholder and planning group review and input. READ Senior Real Estate Manager, Mary Carlson says that the recommendation to market the property is going forward to the Council with no historical evaluation and “simply valued for its highest and best use”. Prospective buyers will need to evaluate how they would evaluate issues such as historic status in their ultimate purchase offer to the City. The two other properties recommended for sale on the proposed action item include a slightly more than half acre remnant of right of way in the Skyline Paradise Hills Community, and the former Logan Heights Library in Southeastern Area Community. Here again there is no record of communication to the locally elected Planning Groups. Another parcel in a designated open space area included on the June 10 Excess Sales Using Brokers list but not included for further action so far was described in the previous SDFP article. The slightly less than a quarter acre parcel was acquired in 1985 with bond funds approved by voters to provide open space in communities throughout San Diego. 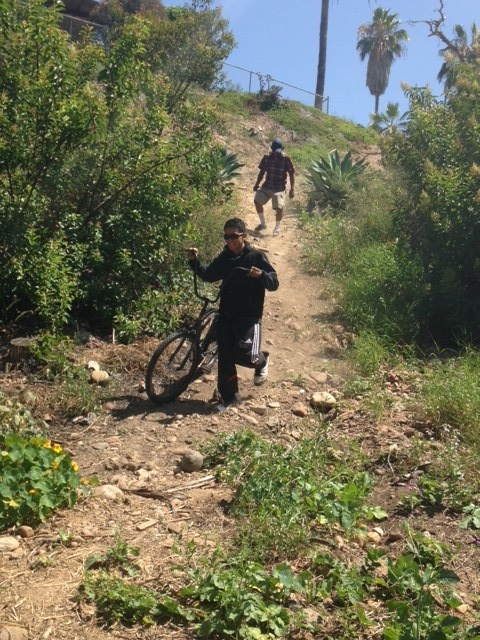 It is a part of the Olivia Canyon (aka 47th Street Canyon) open space system in City Heights. You can hike down from the Fairmount Village neighborhood all the way to Nate’s Deli and City Farmers Nursery on this City-open space system trail. Kids clamber through it on the way to and from Monroe Clark Middle School. Some months ago I met with Bill Tall, City Farmers proprietor and long time community improvement supporter and several of the neighbors and other interested persons who had heard about the proposed parcel sale from the SDFP article. We all echoed the questions asked by the few public speakers who somehow had heard of the proposal at the City Council Committee: why did you chose this parcel in this canyon? Why didn’t you ask the neighbors and the community what they might think of that idea? A few weeks later many of the group of concerned residents and more of their neighbors gathered with the Friends of Olivia Canyon for one of their frequent canyon clean up days. Surely, all open space systems incur costs, but much of the maintenance of the Canyon continues to be a partnership of local residents, Friends of Canyons groups fostered by the San Diego Canyonlands non-profit and City open space ranger staff. It still begs the question: how out of all the thousands of open space parcels in San Diego, did this little less than a quarter acre parcel jump up as a candidate for sale? And why now? While not a conclusive answer to this question, it is an interesting coincidence that approximately a year ago, before the excess property list was presented to the City Council a real estate broker interested in enhancing the development potential of adjacent privately owned parcels expressed interest to READ staff in using this parcel for possible mitigation. Correction: The original article stated that “The READ files reviewed last December did not include a reply from the Parks and Open Space Department to the READ email sent December 2014 initiating the for sale proposal.” The corrected date is July 16, 2013. What public land is up for sale in your district? Older Article: Mural, Lights and Charity at Culture Brewing Co.